A $1 million anonymous pledge to build a fire station at Stevens Commons and a $100,000 donation by a Hallowell resident in support of the Stevens Commons component of a proposed bond package were big topics at Monday's council meeting. HALLOWELL — The City Council unanimously accepted two large donations that will help shape the city for years to come during its meeting Monday night. Two weeks ago, an anonymous donor pledged up to $1 million to build a fire station at the Stevens Commons complex, and resident Joan Sturmthal, who’s served on the Hallowell City council and other city boards, donated $100,000 in support of the Stevens Commons infrastructure component of a proposed bond issue up for a vote later this month. City residents are being asked to vote on a $2.36 million bond package April 28, which includes $600,000 in funding to help fix the roads and sidewalks in the 54-acre Stevens Commons complex. Matt Morrill bought the property a year ago and hopes to turn it into a mixed-use development including affordable senior housing. Sturmthal, who received a standing ovation following her remarks, told the council that she worked in the Stevens Commons complex when she moved to Hallowell in 1981. She said she enjoyed walking around the campus during her lunch, and for years she and her husband have enjoyed hiking and skiing on the trails and in the big field. She said she imagined all the potential for the city if the property could be improved. “Now we have that opportunity. I am making this gift to the city because I believe (owner and developer) Matt Morrill has demonstrated the energy, commitment and vision — not to mention the patience — to make the new Stevens Commons plan a reality,” Sturmthal told the council in a prepared statement. “I hope that my gift inspires residents of Hallowell to support the Stevens Commons project starting by voting for the bond issue on April 28,” she said. “The property already looks better thanks to Matt’s efforts.” Sturmthal declined to disclose other motives, if any, for the donation besides supporting Morrill’s project. The fire station donation comes with strings attached, including the council accepting the pledge and agreeing to build a station at Stevens Commons. City Manager Nate Rudy said he’s been working with Morrill since the donor came forward and expects to have an agreement in place before the April 20 deadline stated in the offer. City officials have wrestled trying to come up with a solution for the city’s fire service that pleases everyone. A committee debated for 13 months whether to preserve the fire department, contract with Augusta for fire protection, or lease space at a proposed Farmingdale station. Under terms of the anonymous donation, the fire station must be built at Stevens Commons. The council approved a clear course of action for Rudy and city staff to implement. Rudy said he is forming a working group with Fire Chief Jim Owens and a few others to begin designing Hallowell’s first new fire station in more than 186 years. Rudy said the city is eager to begin fire safety and life safety inspections, though Owens said the city has no fire code, so he has no authority to issue a violation because there is no code to violate. “As far as our operations, there are some things here that are really scary,” Owens told the council. “It’s a real challenge for us, for example, trying to figure out how to get a guy out on the third floor when we can’t get a ladder back there because of a bunch of wires. “I’d like to be able to enforce some kind of code instead of just making recommendations,” he said. Since news of the anonymous pledge became public, Owens and several firefighters said that department morale “is at its peak.” They said it got “pretty low” during the 13-month committee process, which included more than a dozen public meetings, hearings and workshops. The department now has 15 members — up from 13 — and Owens interviewed another prospective volunteer Monday afternoon. The council voted Jan. 26 to save the department and lease space in Farmingdale’s yet-to-be-built station. 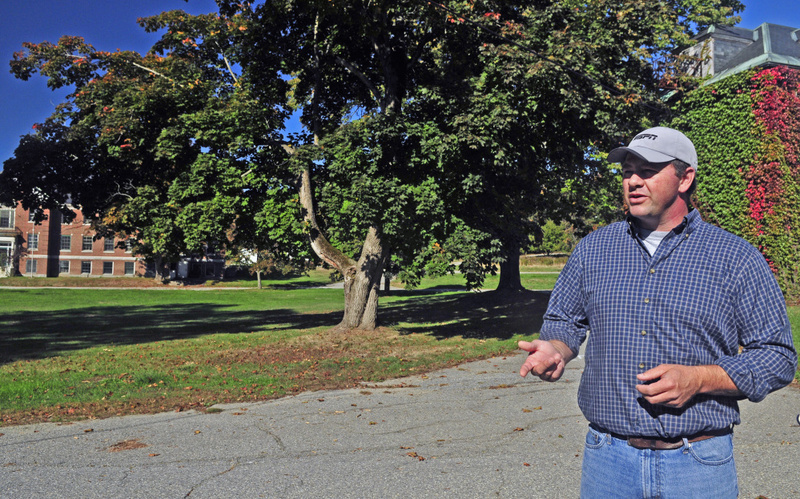 Three weeks later, Hallowell resident Stephen Langsdorf, the Augusta city attorney, circulated a petition that forced the council to revisit its decision. The $1 million donation made that decision easier. The council voted during a public hearing March 23 to rescind the Farmingdale plan and work toward constructing a fire station in Hallowell. In other business, the council approved a moratorium that imposes a temporary 180-day ban on recreational marijuana establishments, social clubs and retail stores. The vote was 6-1 with Maureen Aucoin-Giroux opposing the moratorium and the council suspending its rules in order to enact the moratorium immediately.